Some British army weapons are finding their way into the hands of criminal gangs - and a former Royal Military Police investigator believes they may be ill-equipped to stop it. Mark is in his 30s and he says he now lives a quiet life. But in the 1990s, he had links with criminal gangs in Manchester. He claims to have bought hundreds of guns to hire out to his associates for use in serious crime, and they would often come from an unlikely source - the armed forces. This military equipment came from what Mark considered to be the best source. "In all my deals and associations that I had made, all the hardware that was displayed in those deals were British military issue only," he said. Mark - not his real name - described how his connections with the military were made at a young age because he shared his childhood, and often his early experiences of crime, with people who went on to join the army. "If you grow up on council estates in Manchester, I think a lot of people have two ways of trying to improve their lives: one of those is to join the military and obviously the other is to choose a life of crime." When asked why he and his colleagues went to serving soldiers to get their weapons instead of other criminal contacts, Mark said it was a question of quality. "Obviously it's a lot safer and you're guaranteed of the product and you're guaranteed of the quality of the product." He also explained that army guns would be more likely to have a clean history and therefore would not be linked to previous crimes. "People have a list of what they want and essentially it's as simple as going to Tesco for firearms. You know what you want, you have the contacts and the network there. You place your order, they're delivered," he said. "These deals are occurring in car parks and pubs and places like that." Similar cases were included in Home Office research published in 2006, which was based on interviews with 80 men recently convicted of firearms offences. Two of the men interviewed, one of whom was a former soldier, described how contacts in the military helped them procure weapons. "It was just connections in the army, you come across them things. Buckshee [extra] kit or spare kit," one of them told researchers. Eighteen army servicemen have been dealt with either summarily or by army courts martial for theft of military equipment in the last three years, four of which involved the theft of firearms. Among them was marine John Hickman, jailed last year for seven-and-a-half years for stealing a Browning 9mm pistol from the naval base in Faslane, on the Clyde. The Royal Military Police, which investigates criminal activity in the armed forces, conducts searches of troops leaving conflict zones like Iraq and Afghanistan and entering the UK or other British bases abroad. But a former senior investigator with the RMP, who asked not to be named, told the BBC that Operation Plunder, as it is known, has not always stopped firearms being smuggled back to the UK. "This has quite clearly not been highly successful because of a number of weapons that have got through the system and into the hands of criminals, and there is intelligence to suggest that has taken place," he said. The Donal MacIntyre programme has seen leaked documents spanning four separate months in 2003, detailing cases investigated by the Royal Military Police. In that time, there were nine separate incidents of either firearms or ammunition being discovered after searches. In one case, two assault rifles were found hidden in an armoured car returning to a base in Germany, and a lance corporal admitted to smuggling them out of Iraq. "It does tell a very alarming and serious story about the propensity of some soldiers to resort to smuggling," says the former investigator. And his assessment of the Royal Military Police's capacity to prevent the smuggling of guns and ammunition is equally bleak. "They are inadequately resourced to deal with widespread systematic smuggling. There are just not enough covert resources to look at the whole of the army," he says. The Ministry of Defence said the theft or illegal importation of any weapon was unacceptable. "We have no evidence to suggest that any guns used in UK crimes were smuggled into the UK by HM Forces personnel from the operational theatres of Afghanistan and Iraq. "The MoD takes the loss of any service weapon very seriously. We work very closely with both the civil police and with HMRC to prevent the smuggling of weapons from operational theatres. "Any allegations of this activity are investigated rigorously by the appropriate authorities and, should suspects be identified, they would be tried in a court of law and sentenced accordingly." 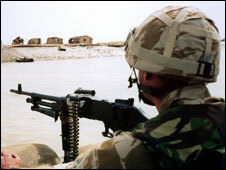 MoD records showed the number of weapons stolen from the services has risen from six in 2005 to 16 last year. The number lost rose from three to 21 in the same period. The Radio 5 Live investigation can be heard on the Donal MacIntyre programme at 1900 BST on Sunday 18 May. Why was a boy aged 13 entrusted with a lethal handgun? Where do guns come from? How does gun crime affect lives? Is it wrong to blame hip hop?